Zucchini burgers that are vegan and gluten free – so delicious that even the most die-hard carnivore will fall in love with. Made with zucchini, chickpea, quinoa and herbs and spices. Your new go to zucchini veggie burger. Zucchini burgers were something I tried for the first time in Cambodia of all places. We went to the Friends Restaurant in Phnom Penh which is known for training youths in the hospitality industry to help them find better jobs afterwards. Cambodia has a ton of NGO companies and eateries and while in Phnom Penh we tried to seek out as many of the food establishments as possible. The service is good, the food delicious and the cause a worthy one. And so started my love affair with veggie burgers. I was never a big fan of burgers and since I try to eat as little beef as possible a regular hamburger is now completely off the menu for me, but not so for veggie burgers. My roommates in college would cook the pre-made Trader Joe’s veggie burgers but I never tried them. I always thought the concept of a veggie burger very strange, and always thought they were just made with mass amounts of black beans. The veggie burger patty we had in Phnom Penh was made with zucchini and chickpeas and the burger was topped with pickled beets, a killer herb mayo, spring mix and caramelized onions. It was lip smacking good. I’m always looking for vegetarian meals to recreate at home and this was a perfect candidate. So though this one is without the beets and caramelized onions I added in some wasabi mayo, edamame hummus, thinly sliced cucumbers, red onions and arugula. A killer combo. Oh and the zucchini burgers are made with quinoa, zucchini, chickpeas and sunflower seeds — talk about mad healthy. You’ll seriously love it. Definitely my new favorite burger right here and these also happen to be vegan and gluten free veggie burgers. And I’m guessing you can freeze the zucchini burgers individually and then reheat them to enjoy this healthy and delicious meal whenever you want. If you don’t have zucchini on hand I have a feeling this would also be incredible with yellow squash or even patty pan squash. What’s your favorite veggie burger? Let me know what you think of my zucchini burgers in the comments below? If you loved this recipe check out my Quinoa with Pesto Walnuts Avocado Kale Zucchini Recipe and my Quinoa and Zucchini with Asparagus Recipe. 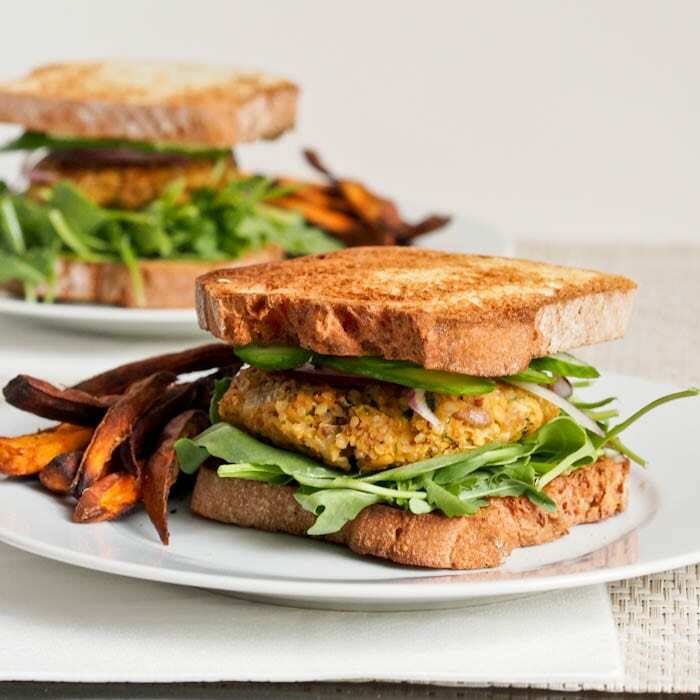 For other chickpea centric recipe check out this Vegan Chickpea Recipes Round Up. 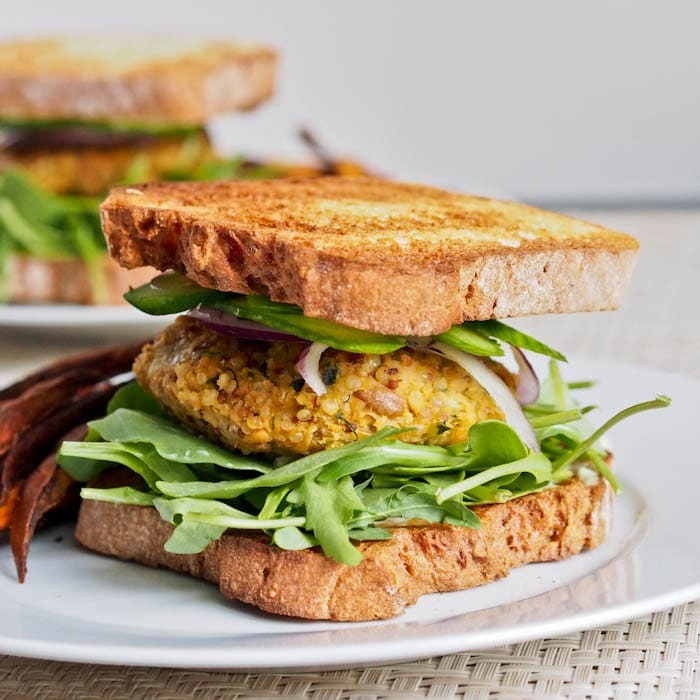 Killer vegan and gluten free zucchini burgers made with , chickpeas, quinoa and sunflower seeds. This will be your new favorite burger. Heat 1 tablespoon olive oil in a pan. Saute onion and garlic until tender. Add zucchini, and saute until zucchini is cooked through. Season to taste with salt and pepper. Set aside. Grind sunflower seeds, sea salt, and pepper in a food processor until the mixture resembles coarse crumbs. Add quinoa, chickpeas, dijon mustard, lemon, dill, and paprika, to the mixture. Pulse to combine a few times and then run the food processor until the mixture is broken up but hasn't completely lost its texture. If you need to, add a little water to the mixture. Place the mixture in a mixing bowl and add the zucchini, onion, and garlic. Mix until combined. Shape the mixture into 6-8 patties with your hands. Optional -- if the mixture feels too moist add quinoa flour and mix, until mixture is a bit more dry and holds together better. After forming into patties freeze the patties for 15-20 minutes (optional) - this helps them stick together better. -bake in a 350 degree F preheated oven on a parchment paper lined baking sheet sprayed with cooking spray for 20-30 minutes. Serve each burger on hamburger buns with a dollop of wasabi mayo, edamame hummus, sliced cucumbers, red onions and arugula. I just love homemade veggie burgers. So much better than store bought. I just pinned this and can’t wait to try. Thanks! Did you end up making these? How did they turn out? Great! Hope you like how the burgers turn out! Will be posting a chickpea salad within a couple days if you’re looking for more chickpea recipes. You can use either. The recipe I got the idea from used pumpkin seeds but I didn’t have those on hand so used sunflower seeds instead. So just go with what you have (or prefer)! How they come out well! I had LSA in the cupboard…probably much finer than recipe wanted but for our first attempt at a vegetarian dinner we loved it! So filling and really easy to make. Thank you for sharing this recipe! Is it possible to bake in oven instead of frying? More healthy. I’m sure you could bake these as well! Please let me know how they turn out if you do. I baked some in oven and fried some . The baked ones were better. Great recipe . Thanks for letting me know. I’ll have to try baking them next time. WOW!! These came out GREAT! I replaced the quinoa with brown rice and added some carrots and baked them! DELICIOUS! So glad to hear you enjoyed these!! Will have to try adding brown rice next time! I am sure you could use amaranto or millet, please let me know how it turns out! Hello hello, thank you so much for your prompt reply. I made a few substitutions because I was so excited to try this recipe with fresh zucchini picked right from the veggie garden. So I used a cous cous left over in place of quinoa, mixed seeds, leek in place of onions, no dill. So I used a litlle buckwheat flour and then simply cooked them on an unsticky pan with just a drop of oil right on top of each hamburger. I ate them with grated raw carrots, zucchini and salad placed in a whole grain tortilla with mustard. Olive oil on top. FANTAFAB! These burgers tasted pretty good, but they completely fell apart. How do you keep them together? I made these, excellent flavor, mine fell apart, I will wring out zucchini in the future, served mine on a salad with lemon and olive oil dressing, put a dollop of cilantro, mayo, garlic, lemon, soy sauce, and sesame oil concoction….yummmmmmm! Glad to hear they tasted great but it’s a shame they fell apart! Love the way you served these – sounds delicious! I think thoroughly wringing out the zucchini should help — or try to add a bit of quinoa flour. Thank you thank you thank you! 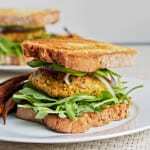 This is the best chickpea burger recipe I have come across! Meat-loving hubby devours them and they are now part of our weekly meal planning. Leftovers are an easy breakfast for me too when I’m in a hurry. I’ve made them half a dozen times now and they don’t fall apart for me but I do cook them in a pan on grease proof paper to make handling easier and I also don’t make them too big. That may help people? I used lentils instead of quinoa as I only had quinoa flakes in my cupboard at the time. I also used tumeric, curry powder and a bit of vegan stock powder for extra flavour as I had no mustard. To keep them together I used almond meal. Absolutely beautiful I cant get enough! My Fiancée loves them too. Good to see a recipe without rice or potato so you dont feel as bad putting them in a bun. Thank you I really love these! I noticed that everything is vegan, but I recall trying to buy some Udi’s Bread a while ago. I looked through the ingredients and the one I was looking at in particular had eggs. Not sure if this is the same for most Udi’s brand breads, but I was wondering if you knew about this too? Just curious because I’ve been looking for decently priced gluten free breads. It does look like Udi’s uses eggs in their bread but I am sure there are companies that do make gluten free and vegan breads, or you could always try baking your own using flax or chia “eggs” to be perfectly sure. Made these tonight and it’s a new favorite!! Delicious and not very heavy on the stomach. Only problem is that I think we processed the seeds and zucchini a little too much, since I had to do both separately from the rest of the ingredients because my blender is awful and needs to be replaced. I turned the seeds into a powder and pureed the zucchini/onion/garlic mixture. Still tasty but I’m wondering if that is why it came out so gooey and mushy? So glad you enjoyed this recipe Erin! If you are using a blender instead of a food processor I can see why the seeds and zucchini might be blender a bit too much. I do think that may be why it came out a bit gooey and mushy. I made this in a food processor and processor the seeds until just broken down, and the rest of the mix, until just combined, but not until smooth and pureed. Either way as long as the dish was delicious that’s all that counts! This recipe is a disappointing combination. Firstly I had to season the mixture for the lack of flavor was astonishing, the exception being the dill which was offensively overwhelming .Then the patties completely fell apart as I attempted to flip them which I would blame the high moisture content of the quinoa, lentils would be a better option. Certainly one of the most disappointing recipes I have tried in quite some time. Patrick, I’m so sorry you did not enjoy the recipe. When I made these I did not find the dill overwhelming but I personally love dill, so if you prefer another herb you could use that instead (parsley, basil, etc). I have received comments that the patties fell apart for others too, though they did not for me when I made them. I think adding a bit of quinoa flour could help the mixture hold together better and making sure that the zucchini is squeezed dry after grating would make a big difference too. I have added these notes to the recipe. Freezing the patties for a few minutes after shaping them could also help them stay together, and baking them instead of pan frying them would help too. Once again I’m sorry the recipe didn’t work out for you! Anyone have nutritional breakdown on these? I have just added it to the recipe. So take a look! I am looking forward to making this for my son. He and his girlfriend have been vegans for awhile and I’m trying to find all kinds of recipes for them, plus he’s a recent graduate (who gets to stay home while goin to college ) so I’m trying to put a recipe book together for him when he decides to move out. Hope your son enjoys this recipe Michelle! 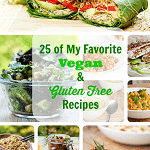 You will find many different vegan recipes on my blog if you are interested in testing out any others. The recipe book sounds like a wonderful gift!